Summary: Save Your Legs! is an inspirational journey from the heart of Australia to the soul of India. It’s the story of one man who refuses to lose his park cricket team to the realities of growing up. 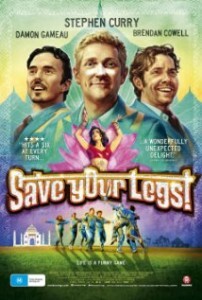 An uplifting adventure filled with comedy, cricket and Bollywood music, Save Your Legs! is an odyssey from the suburbs to the sub-continent in pursuit of a lifelong dream. It’s a shame that when Australia’s two biggest pastimes are cricket and Australian Rules that we can’t seem to produce a decent film about either sport, unfortunately that continues with ‘Save Your Legs!’ a cricket film that does its best to lift itself out of a rut but at the end of the day still sits in the ‘disappointment’ camp. Based on a true story ‘Save Your Legs’ follows the Abbotsford Anglers, a team captained by Theodore ‘Teddy’ Brown (Stephen Curry – ‘The Cup’ TV’S ‘Redfern Now’) who lives and breathes for cricket and also idolizes Indian cricket great Sachin Tendulkar. However Teddy is very much a man child and while his best friends Stavros (Damon Gameau – TV’S Raw, TV’S ‘Puberty Blues’) and Rick (Brendan Cowell – TV’S ‘The Elegant Gentleman’s Guide To Knife Fighting’, TV’S ‘Howzat! Kerry Packer’s War’) have grown up (in a sense as some of their behaviour would suggest otherwise) and become involved in serious relationships or started families Teddy still lives in Stavros’ garage and seems to only live for cricket. As Teddy begins to realize that things need to change he decides that the Abbotsford Anglers should be the team that represents Australia in an exclusive limited over tournament. But when they arrive in India they discover that the other teams are all professional and the inclusion of young gun Mark (Brenton Thwaites – ‘Blue Lagoon: The Awakening’, TV’S ‘Home And Away) is causing ripples in the team… well that and the fact that most of the team, including one of their best players The Prince (David Lyons – ‘Safe Haven’, TV’S ‘Revolution’ see it is a free holiday. 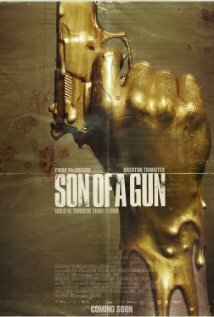 Director Boyd Hicklin (‘Peak 08: The Road To Beijing’, ‘Save Your Legs’ (docco)) does do a wonderful job making this film look good. Like recent film ‘The Waiting City’ he captures the hustle and bustle and the landscape of India wonderfully well for the screen but he is let down badly by screenwriter Brendan Cowell (TV’S ‘The Slap’, TV’S ‘My Place’) and a casting choice that sees one of Australia’s finest comedic actors, Stephen Curry, in perhaps the only role in the film that doesn’t have any comedy to deliver. But really the biggest fault with this film lays with the script. Too many of the so called funny moments just aren’t funny and it seems that the movie has missed out on a golden opportunity to throw some important men’s issues (such as male depression) out into the public spotlight. An even bigger crime however is the fact that most of the characters are just walking clichés so as a result the audience never finds themselves warming to them in the way they should. Sadly the acting is also well and truly below par with the only highlight being Brenton Thwaites who announces himself as a star of the future. Unfortunately though the likes of Stephen Curry, David Lyons and Brendon Cowell who normally put in a great performances are sub-standard, largely because of the one dimensional characters that they have been given to play. 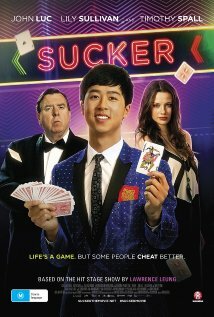 ‘Save Your Legs’ is sadly another Australian film that ends up on the pile titled ‘Should Have Been A Lot Better Than It Actually Was’. Other Subculture Media Reviews of ‘Save Your Legs′: Check Episode #22 of our The Good The Bad The Ugly Podcast for a more in-depth review of ‘Save Your Legs’. Dave Griffiths also has another review of ‘Save Your Legs’ available on the Helium Entertainment Channel.